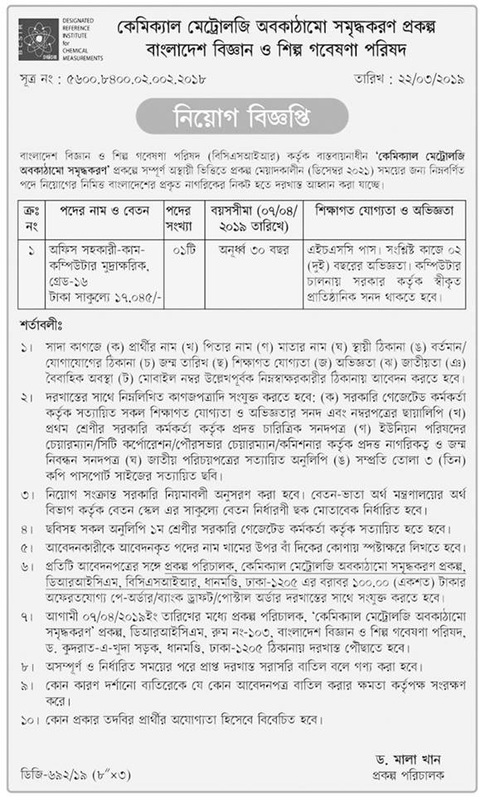 Bangladesh Council of Scientific and Industrial Research (BCSIR) Job Circular 2019 Has Been Published in Daily Newspaper also to get in BD Jobs Careers. For Your Information, Bangladesh Council Of Scientific And Industrial Research (BCSIR) is a scientific research and regulatory body organization in Bangladesh. Its main purpose is to track scientific research for the improvement for the Bangladeshi people. It was established on 16 November 1973. In recent time the organization published new government job circular 2018 for hire to new job holder. If you are interested for government jobs Bangladesh as well as Bangladesh Council of Scientific and Industrial Research (BCSIR) Job Circular 2018 is good choice for you and any job seekers. Just here to find out all of necessary information about government jobs news 2018, we already include full details with job circular image. Check out and great ready for Application. Post Position:Various Position, Follow Below Job Circular Image. This entry was posted in All Jobs, Government Jobs, Graduate Jobs, Independent Newspaper, Newspaper Jobs and tagged bangladesh council of scientific and industrial research( bcsir) job circular 2017 by admin. Bookmark the permalink.